A 76 mm bending capacity is built into our pipe benders, and this small, custom die kit is the product of our exclusive step-cut manufacturing process that contains larger-sized tubing for a more uniform bend. You can bend 76 mm tubing, but you can also expand and flare. The bending possibilities are virtually endless! All BendPak tooling is precision-machined from solid steel. After the CNC machining process, the tooling is gas carburized, oil quenched and heat treated to a minimum hardness of 58 Rockwell. 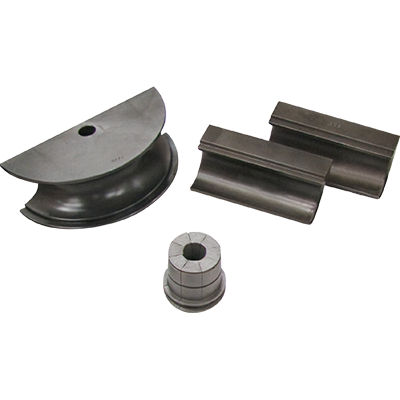 No cast or ductile (brittle) iron is ever present in any BendPak pipe bender tooling.